Last year was our first full year homeschooling Charlotte Mason (with a little bit of classical) style. For the most part, I loved it. I still have a few things to figure out schedule-wise but on the whole, I thought it went over really well for our first year. As I am still learning her methods, I love learning more and more about how to succeed with this kind of homeschool method. Finding time however to learn can be difficult. I really love podcasts. I think they are great to listen to and I can usually find plenty of time when I am driving around doing errands, completing household tasks, like folding laundry or when I am at the grocery store by myself (Yes, this does happen). I find that even if you don’t choose this method for homeschooling, Charlotte Mason as a lot of good information about parenting and family life in general. If you homeschool the Charlotte Mason way or are interested in learning more about her methods, here are some great podcasts you can subscribe to for inspiration on your homeschool journey. The Mason Jar is put on by the Circe Institute and is done by Cindy Rollins, the author of Mere Motherhood. She often does a Q&A mode where she answers questions from the Mere Motherhood Facebook group about cm, parenting, and homeschooling. She also will have guest speakers on to discuss various parts of a cm education. I have loved listening to this podcast since I found it. I feel like Cindy has a very laid back personality, which is definitely me. She has a lot of experience to share after raising and homeschooling 9 kids. I’m always very encouraged after I listen to this podcast. Unfortunately, they have stopped making new episodes. I don’t know how long they will keep the podcast up so I would definitely binge listen to these while you can. A Delectable Education is a podcast run by three ladies, Emily Kiser, Liz Cottrill, and Nicole Williams. This podcast is really great for getting down the nitty gritty of how the Charlotte Mason method works. They are consistently pulling out points from her books and showing what that looks like. They also will bring in special guests who have really dug into certain parts of the Charlotte Mason method so you can understand how to put it into practice in your homeschool. I really like to listen to this podcast when I need to understand the nuts and bolts of something like what should we be doing in a certain form or how often does recitation happen and what does it look like. If you really want to get an understanding of how this method works, this is the podcast for you. I was just recently introduced to this podcast by a friend and I am enjoying it so much. It’s done by Bill St. Cyr who is the Executive Director of Ambleside Schools International along with his wife MaryEllen who contributed to When Children Love to Learn. One of the things I love about the CM method is that so much of it applies just to raising children. Even if you don’t follow the CM for homeschooling, I think there is so much here for parents to gain about raising children with Christian values and how to do life together. I have been really challenged in my parenting from this podcast. Ok, now this one isn’t exactly a CM podcast. But I love it anyways and it fits so I included it as well. Sarah Mackenzie hosts the Read-Aloud Revival Podcast and this is the go-to podcast for reading, book recommendations, and everything in between. Since CM is very focused on living books and good quality literature, The Read-Aloud Revival podcast is a great place to find out about books to read as well as tips on raising children who love to read. The Scole Sisters is put on by Brandi, Pam, and Mystie. I was introduced to them when they did a joint podcast with Cindy Rollins from The Mason Jar. 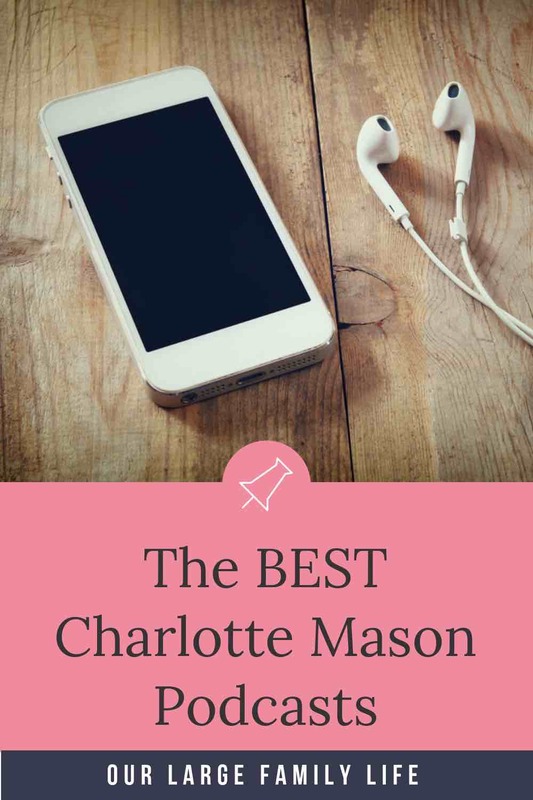 They don’t focus strictly on Charlotte Mason but have more of a classical leaning, which pairs well with Charlotte Mason. Podcasts are a great way to learn and be encouraged from on our homeschool and parenting journey. They are a great way to use the time when we are running errands, shopping, driving, or even just getting things done around the house. It’s a great way to use those minutes to receive some encouragement and training in our homeschool journey. I’m sure there are other podcasts that cover topics related to Charlotte Mason or Classical homeschooling, but these are the ones I’ve listened to so far and have loved. I hope you will enjoy them too. What is your favorite podcast to encourage your homeschool journey? « 13 Picture Books That You Won’t Dread Reading.